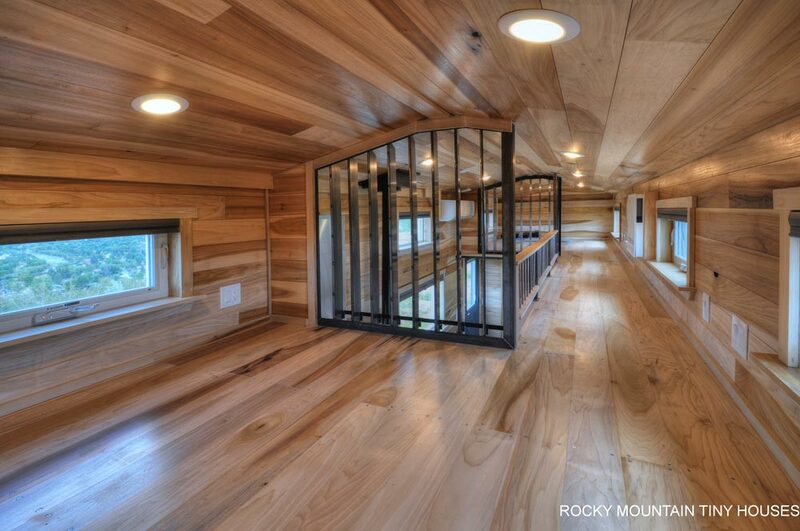 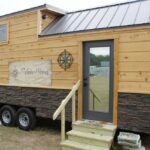 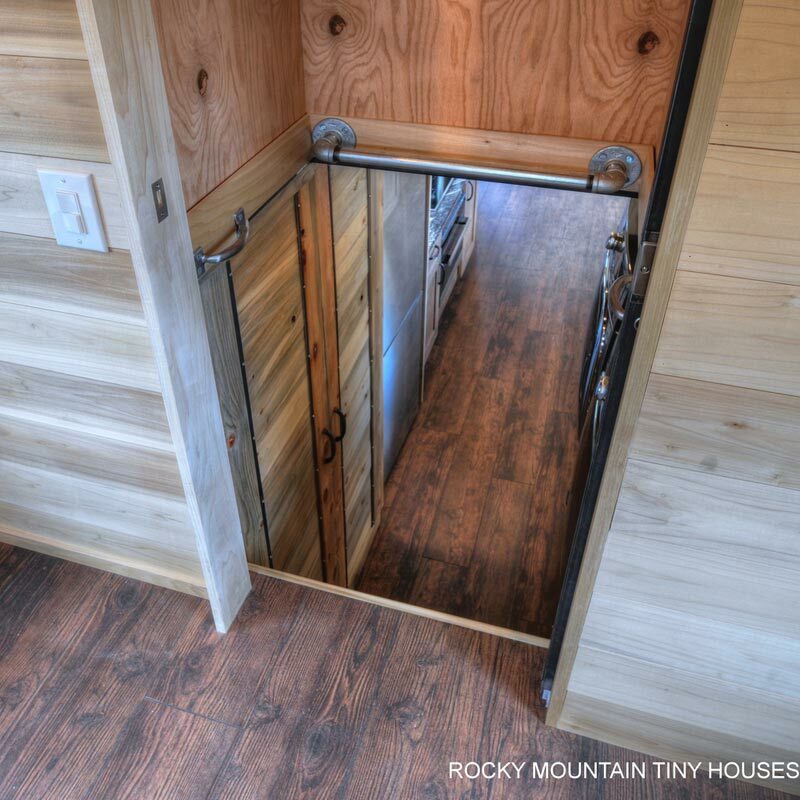 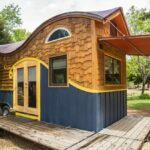 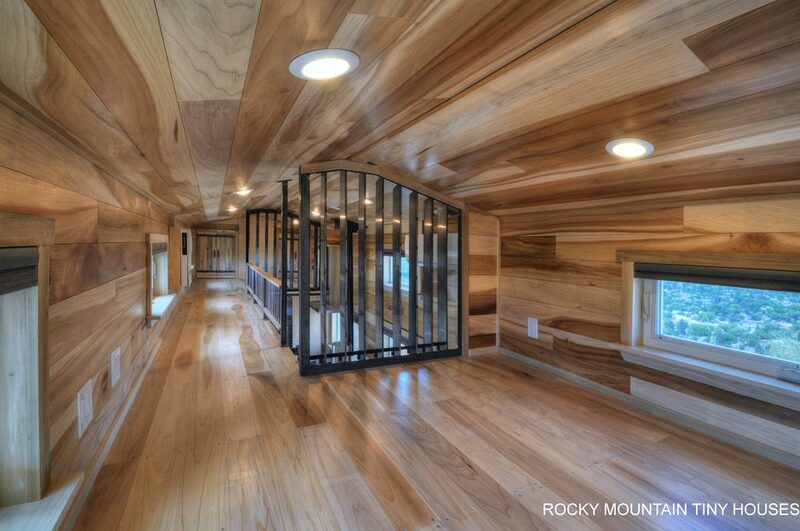 Designed and built by Rocky Mountain Tiny Houses for a family of five is this 460-square-foot gooseneck tiny house, the Pemberley. 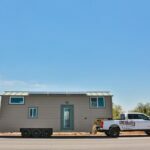 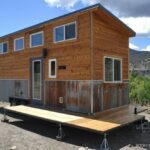 The tiny house trailer is 30’+7′ and was a custom build by Trailer Made with Dexter air ride suspension axles and an automatic leveling system. 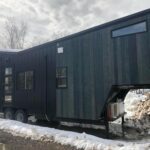 The Pemberley was constructed from structural insulated panels (SIPs), providing superior strength and insulation compared to regular 2″x4″ framing. 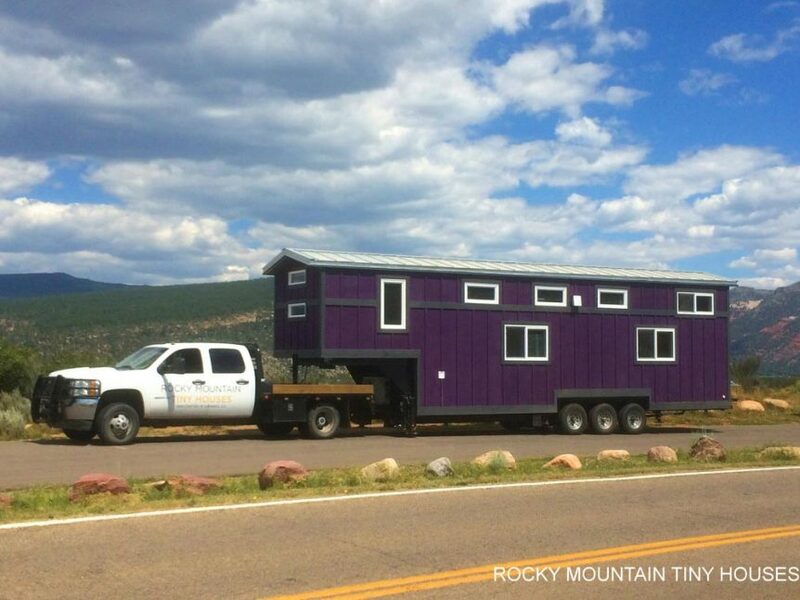 The exterior is cedar board-and-batten siding painted purple with grey trim. 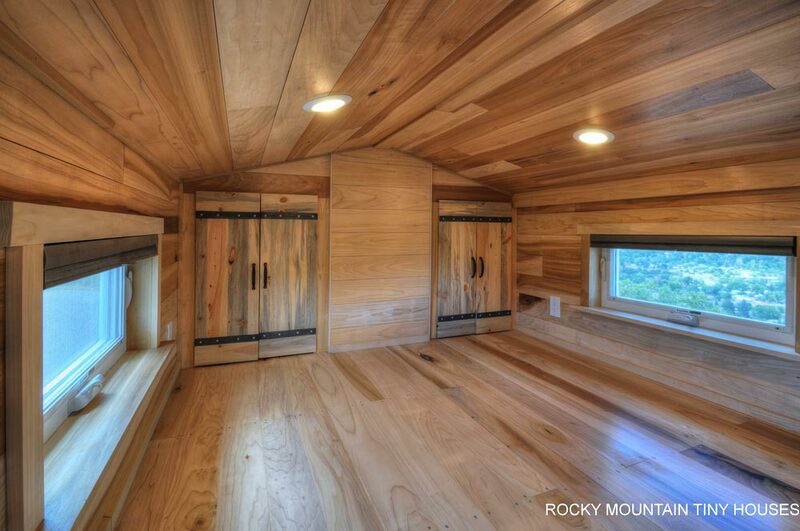 The Pemberley’s interior is finished with clear coated tongue-and-groove poplar and engineered cork flooring. 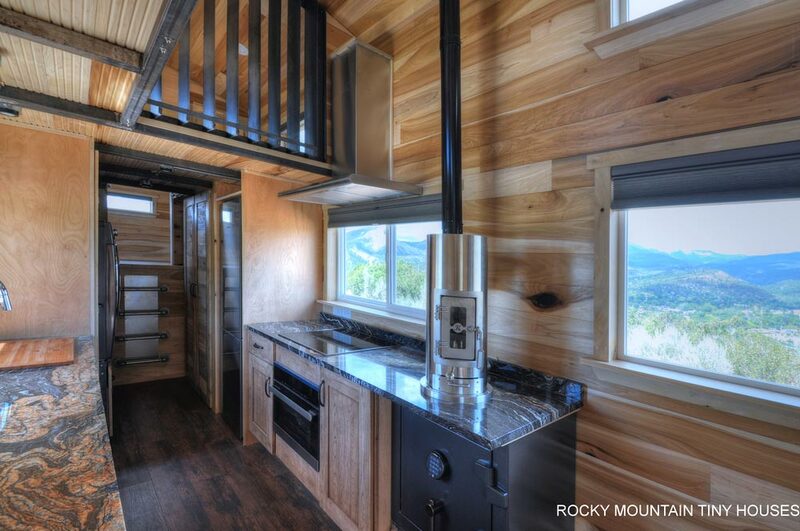 The kitchen has a heavy duty safe, Kimberly wood stove, beautiful Orinoco granite countertops, and cherry cabinetry. 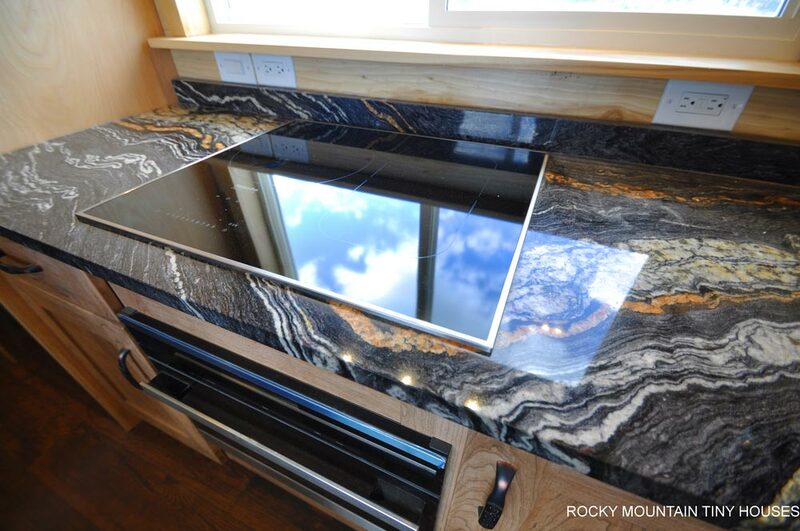 Top of the line appliances includes a Miele induction cooktop with matching range hood and steam oven, and a 10 cu ft Bosch refrigerator. 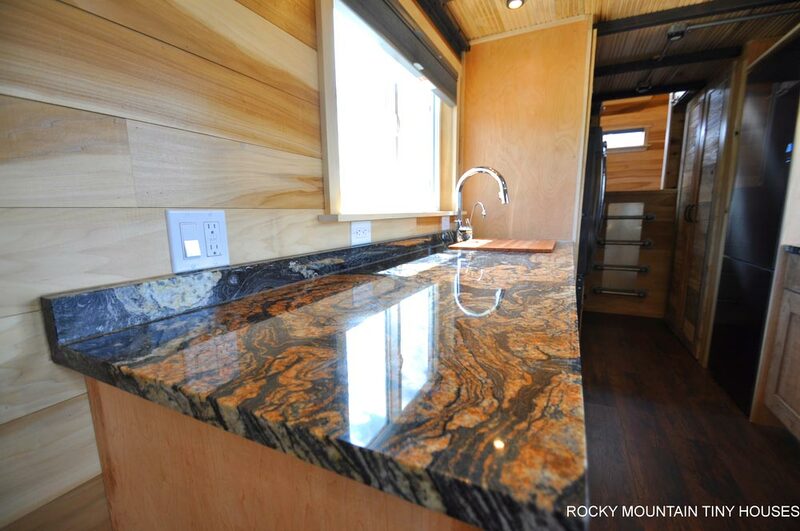 There is also an InsinkErator hot water dispenser for instant hot water. 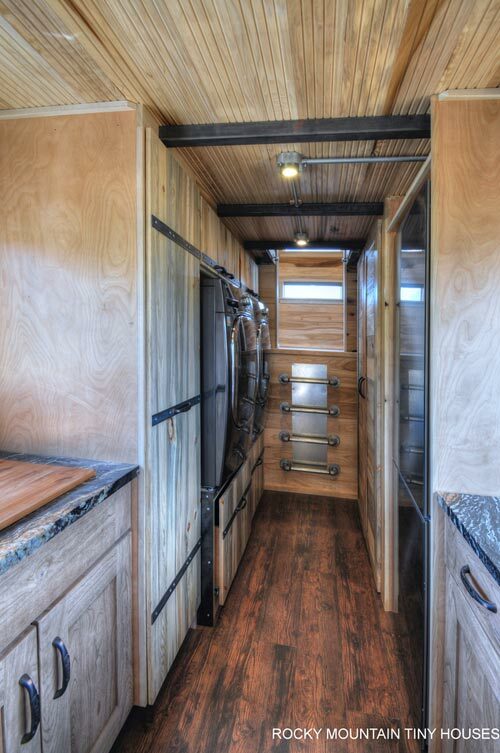 Next to the kitchen is a pull-out pantry, an LG front loading washer with matching dryer, and a large closet area. 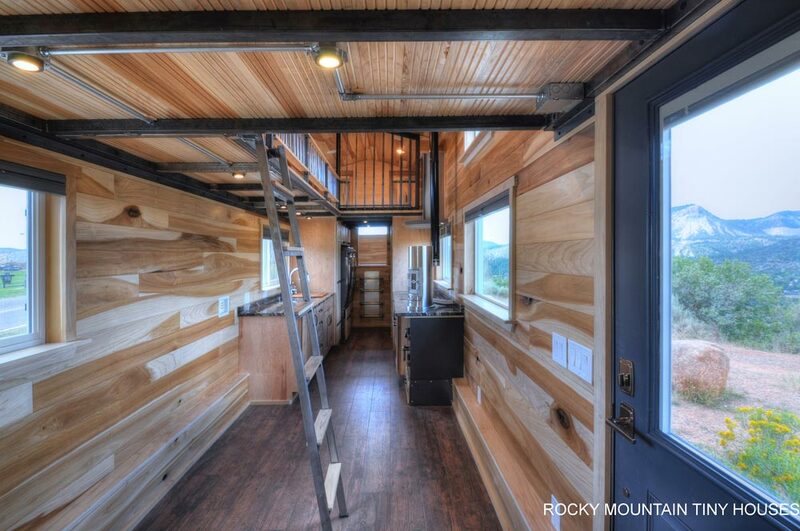 Past this area is a steel pipe ladder that leads up to the kids’ bedroom over the gooseneck. 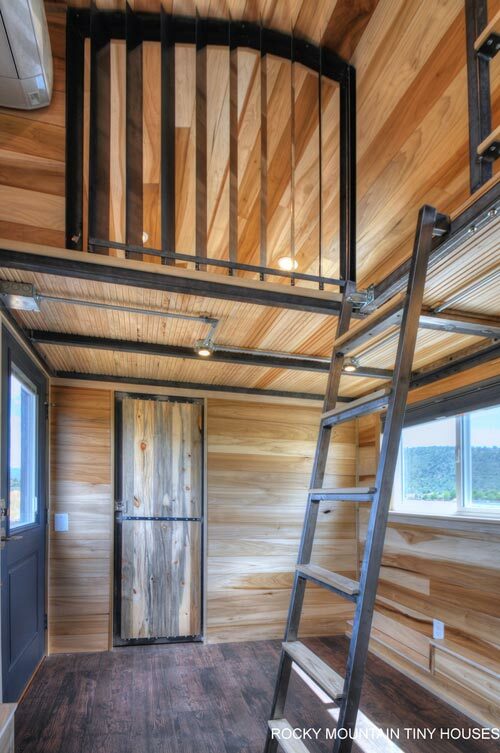 In the bedroom is a bunk bed with trundle for a guest. 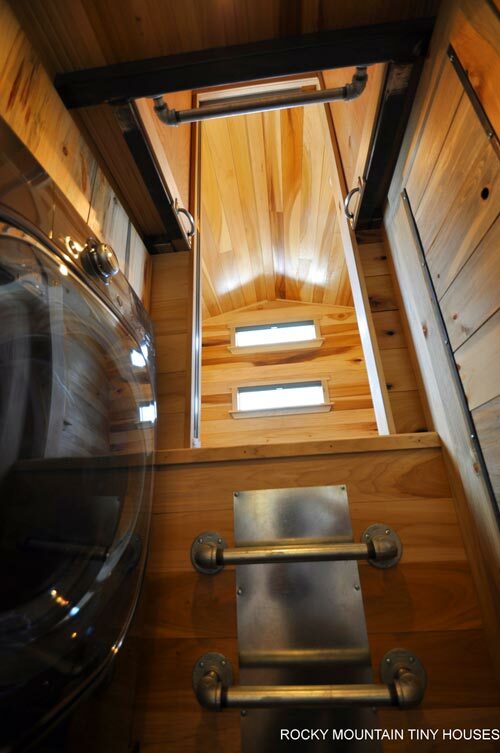 A swiveling ladder leads up to the huge two bedroom loft with catwalk. 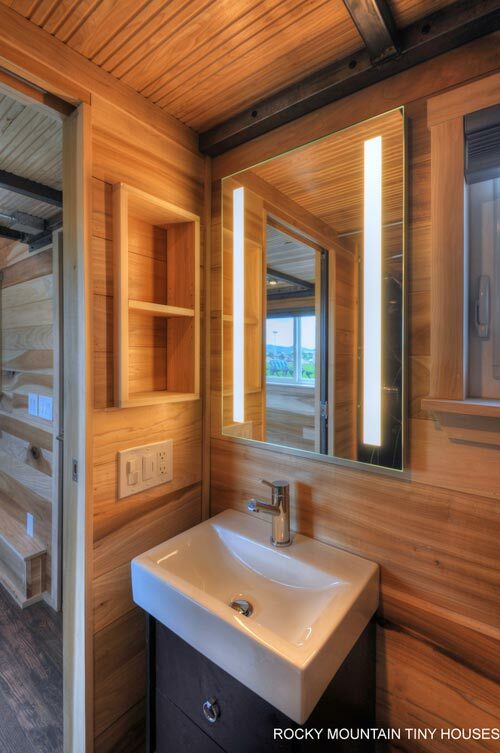 The master bedroom is large enough for a king bed and there are vertical louvers that can be closed for privacy. 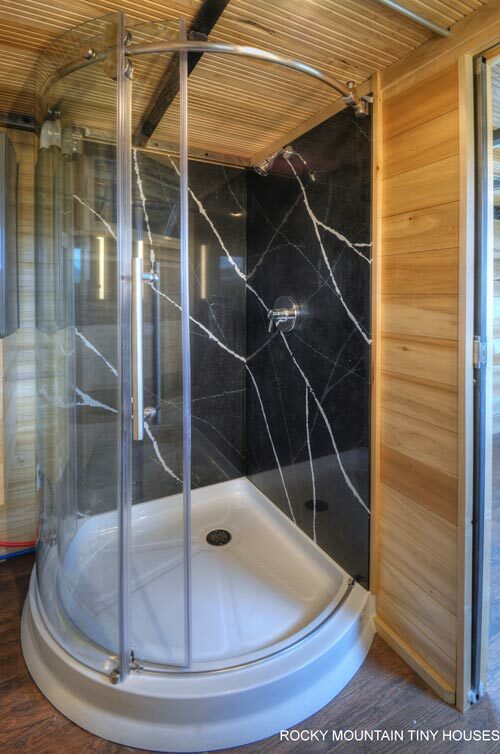 The bathroom includes a round shower enclosure with silestone walls, a lighted medicine cabinet, and a composting toilet. 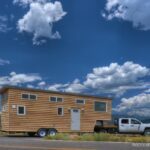 For a lot more information about the Pemberley, you can watch the video tour below, then visit Rocky Mountain Tiny Houses website.